Well, today is a day full of emotions and memories. Today, Adobe announced the end-of-life of GoLive. Effective immediately, we will no longer be developing or selling GoLive. Of course, for many longtime GoLive users, they have sensed and even stated to me that the writing was on the wall the day that Adobe acquired Macromedia. With a dominant marketshare in comparison to GoLive, Dreamweaver is the tool that, of the two, would emerge as the HTML authoring tool from Adobe. But for me, it’s more than just simple bottom line arithmetic. GoLive will always have a very special place in my heart – even though I’ve been the primary Dreamweaver evangelist for almost 10 years now. You see, dear reader, I was present the day the first lines of code were written for the application that would become GoLive. For me, it’s a journey that started in Hamburg, Germany in 1990. At the time, the internet wasn’t even on anyone’s radar (ours included). At the time, I was the Product Manager for a Hamburg-based software company known as P.INK. We built the first successful desktop-based publishing system for newspapers and magazines. Those were great times… as the publishing industry was in a state of transformation. And, with the transformation, many publishers quickly began looking for ways to repurpose this new digital content. Our own desire was a way to retrieve and digitally republish the content from our editorial database. Thus was born the P.INK Web Editor, released for testing to some of our clients, who, in turn, just stared at it – not realizing they were looking into the future. And with that release, the HTML editor wars began – but our renamed “Cyberstudio” quickly became the tool of choice for any Mac user building those early web sites. It was so successful that we were even approached by Adobe itself. Fortunately, or unfortunately – depending upon your point of view, those early negotiations were unsuccessful. It’d take another 18 months or so for the acquisition to become a reality. 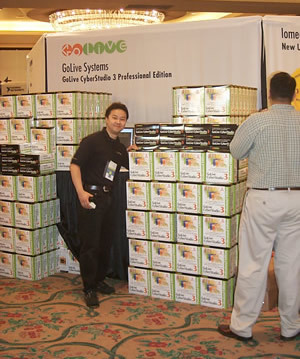 In the meantime, there were many, many good memories made and people met… Like the Worldwide Apple Sales Conference where we gave away a box of Cyberstudio to every Apple employee! Our friends at Macromedia were so taken aback by this that they even complained to Apple directly! Must have been frustrating for them to watch every Apple person walk by their booth with a copy of Cyberstudio in hand! Or, how about the MacWorld where we put a dumpster on our booth! If you put a copy of any competing product in it, we’d give you a copy of Cyberstudio… Even we had no idea what a silly idea that was – or more correctly, how many times we’d have to empty that dumpster! Of course, success breeds opportunities and change. For us, that came when Adobe came calling a second time at the end of 1998. Having failed to get a new version of Pagemill out the door, the stars aligned and we became Adobe. But for me, the change had an even bigger impact. After some very serious internal debate, I decided to leave Adobe for the greener (there’s a pun there if you look closely) pastures of Macromedia, where I helped begin to shape Dreamweaver – and in turn, attempt to kill GoLive. Am I the only one who sees the irony in all of this…? And btw, click either of the two pictures here to go to a set of more trips down memory lane in my Flickr stream. Well, there’s been a lot of back-and-forth between the two camps over the years, some justified and some just poking fun. But in the end, I think that we can all be truly proud of what we accomplished. To those GoLive users out there, my heart goes out to you. It’s never easy to watch your favorite product reach this point. However, there are many of us still here at Adobe who worked on GoLive over the years, and who now are directly involved with making Dreamweaver an even better tool. Yes, there are still things in GoLive that we don’t (yet) have in Dreamweaver, but we’re eagerly working to fill those holes, while continuing to advance Dreamweaver with cutting-edge new features. In fact, just last week, I had the extreme pleasure to “sneak” a few of those features at An Event Apart in New Orleans. To say that the audience was excited would be a gross understatement. I wish I could tell you about all the things we have planned, but that will have to wait a while. Until then, I’ll look back on today with a tear in my eye… but also with a huge smile on my lips. In the words of my hometown, Laissez les bons temps rouler! There’s tons of web authoring goodness yet to come. Now raise your glass and let’s give one last toast to GoLive… Prost! I vividly remember you presenting at MacWorld. How weird seeing that old picture just made me realize that. I LOVED CyberStudio and always felt it had great promise.My favorite feature was the way you could throw the panels any which way you wanted and it’d stick as a tiny tab. Hated the way Adobe Adobe-ized the panels. They should have adopted the way it worked. :( As much as I love my Dreamweaver, and I do, I always thought it was ashame what happened to GoLive. I was never able to teach it because I felt Dreamweaver became more intuitive. Like InDesign over Quark. I got my free copy as press at a MacWorld. BTW. I don’t think I threw another product in the trash to get mine. And for whether it was fortunate or unfortunate for Adobe to acquire CyberStudio or not. To me it was a sad day for that particular product. Currently an Adobe Community Expert for Dreamweaver, Adobe User Group manager and Adobe Certified Instructor for Photoshop, Illustrator, InDesign, Flash and Dreamweaver. Wow – I remember using CyberStudio way back when. Glass raised, irony and all. Cheers! @Dee – well, the mini panels are making a comeback (see the CS3 products). Not exactly the same, but fun to see nonetheless. As I said, a day of mixed emotions for sure. @Greg. Yes, I realize they tried to make a comeback, but come on, CyberStudio did it way cooler. Being able to throw them any direction you wanted was great. Irony aside, I understand the mixed emotions. Small world. I always wondered what happened to you. I thought you were a great presenter back then, very dynamic. One of the reasons I became an instructor. You and Tom Pitrello (or however you pronounce his name)and of course, Terry White. I have no doubt that Dreamweaver will ultimately bring all the innovations that we saw in GoLive – especially if you have anything to do with it.